A wonderful Australian antique crescent moon and flower brooch, dating to Victorian era, circa 1895! 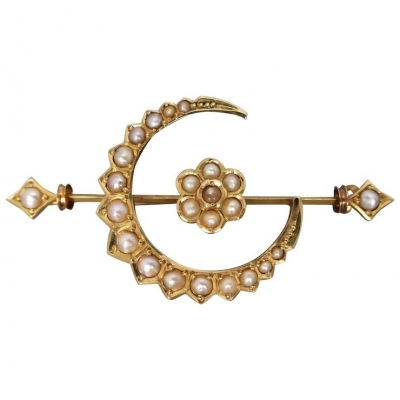 Made of 15ct yellow gold, this divine brooch features 24 lustrous seed pearls which line the crescent, and highlight the central flower profile. 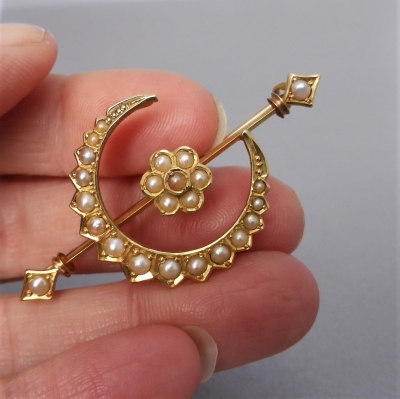 A single pearl is nestled at each 'arrowhead' end. 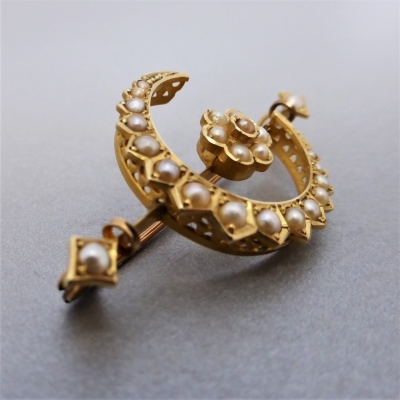 The pearls are more than likely natural as this brooch dates back before cultured pearls were invented, however the pearls have not been x-rayed. 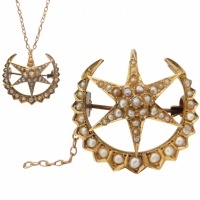 A beautifully made piece with opulent detail, comprising of a hand-pierced lattice detail along sides of crescent and a point at each seed pearl interval. 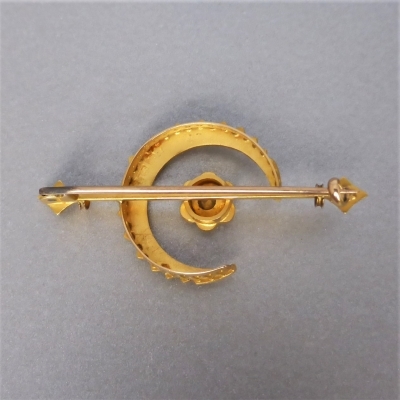 The crescent and flower rests on a knife-edge bar which features an arrowhead profile and delicate concave band across each end. 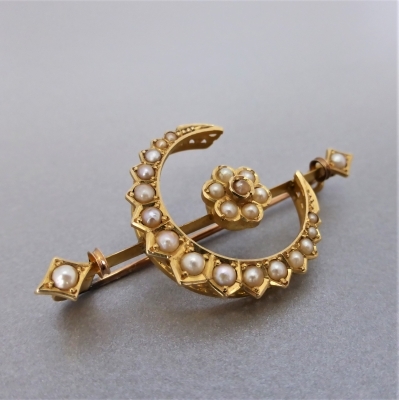 The pristine condition brooch still leaves behind the original frosted gold finish.... adding further lavish antiquity! 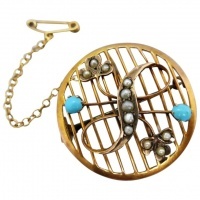 A pin and 'U' shaped connection attaches to back. 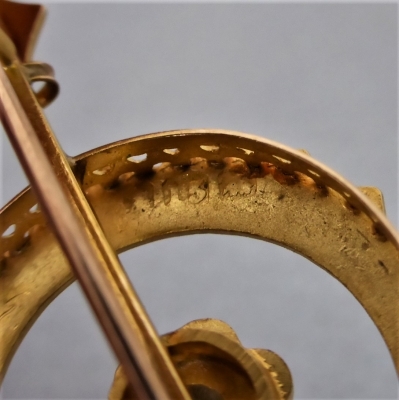 The hallmarks indicate this piece to be Australian origin with the 'hanging sheep' (15ct stamp), "15" is also stamped. The 'hanging sheep' stamp was used in Australia between 1889-1920. 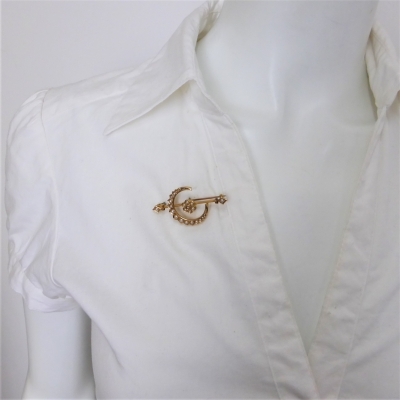 There is also a 'unicorn' stamp - derived from the family crest of T Willis and Co, a prominent jeweller in Melbourne, Victoria in the late 19th century and early 20th century. 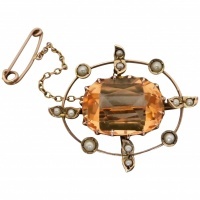 A wonderful antique brooch which would make a special addition to any collection! Hallmark: 'hanging sheep' (early Australian 15ct stamp), '15' and 'unicorn' - makers mark for T Willis and Co of Melbourne, Victoria.